Occasionally the Restoration Team would make discoveries that on first glance did not appear to make sense. One of these discoveries was the two sets of chair rail nailers discovered on the walls of the Dining Room. To further confuse the Team it was found that even though the Dining Room was built in ca. 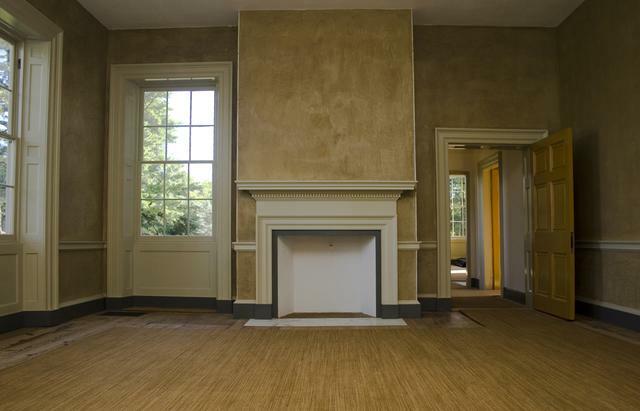 1797, physical and documentary evidence revealed that all of the architectural trim, including the chair rail, mantel and door trim, dated to ca. 1812. However, in all other rooms of the ca. 1797 addition, such as the North Passage and the Small Bedroom, clear evidence of ca. 1797 chair rails and baseboards survived with no evidence found for any ca. 1812 chair rails or baseboards. So why was the Dining Room the only space in the ca. 1797 house to get ca. 1812 chair rail and baseboard? The Dining Room with its ca. 1812 trim restored.